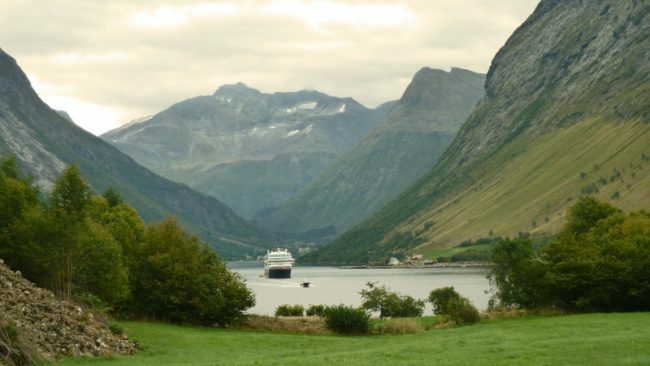 Norwegian Classic Voyage Southbound – The Great Canadian Travel Co.
What began as a mail and cargo route is now one of the world’s most spectacular cruising experiences, yet still serves as a supply line into the coastal communities. 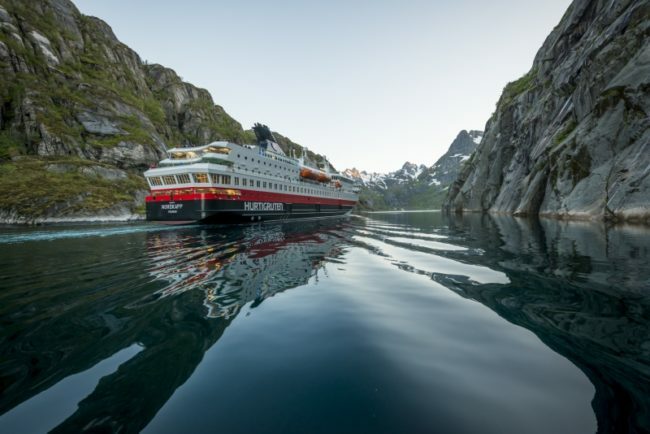 Flexible with daily sailings, casual and informal, unique with exceptional crews, the classic southbound Norwegian Coastal Voyage takes you from Kirkenes to Bergen one way. Before your cruise you can spend some extra time exploring the far north of the country or spend some days in Bergen afterwards. 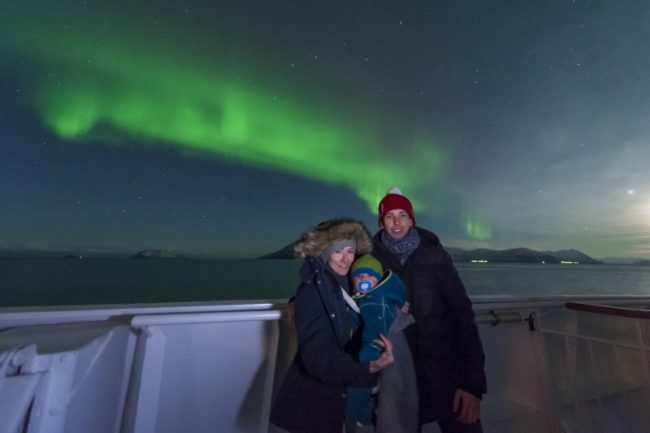 Fly from Oslo to Kirkenes, just a few miles from the Russian border, which can be visited by bus, riverboat safari or ATV/quad-bikes, depending on the season. Kirkenes is known as the capital of the Barents region and the gateway to the east. Local road signs are written in both Norwegian and Russian. The vistas are dramatic here and we highly recommend you arrive a day or two earlier than your sailing date, to give yourself time to explore this fascinating area. As the ship starts its cruise, you can enjoy lunch and views of the surrounding Arctic landscape on deck or from the panorama lounge. In the afternoon the ship docks at Vardø, Norway’s easternmost port where, weather permitting, you might be brave enough to experience a dip in the Arctic Ocean. South along the Varanger peninsula to Båtsfjord, before reaching Berlevåg, home to one of Norway’s most famous male choirs, consisting mainly of local fishermen. 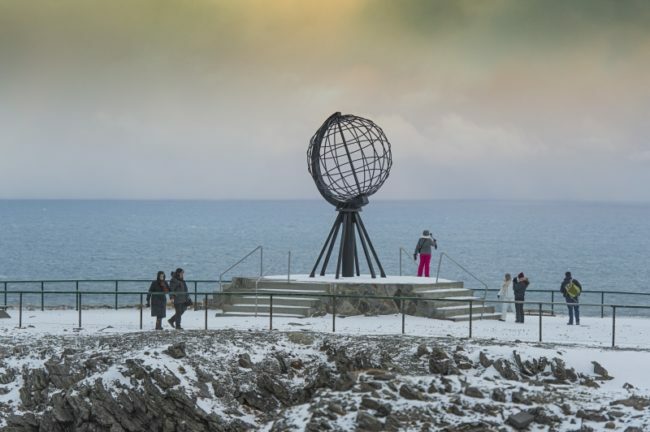 Enjoy the magnificent sub-Arctic landscape as we near the 71st parallel on our journey towards the North Cape, the northernmost point on the continent. 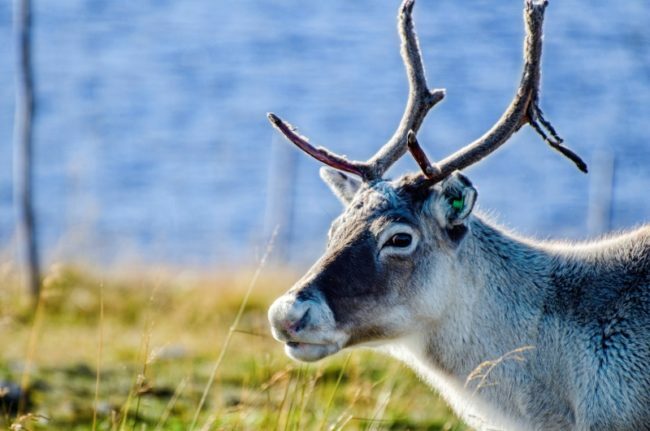 In summer, you might see herds of reindeer and campsites belonging to the indigenous Sámi people. In winter, experience the snow-clad valleys, the fresh winter air, and your best chances to see the mesmerizing northern lights. In the middle of the night we dock at Mehamn, where it is possible to join an unforgettable snowmobile trip (winter) through one of Europe’s most extreme and exciting natural areas. Experience the snow-clad valleys, the fresh winter air, and a chance to witness the mesmerizing northern lights in the clear, starry sky. 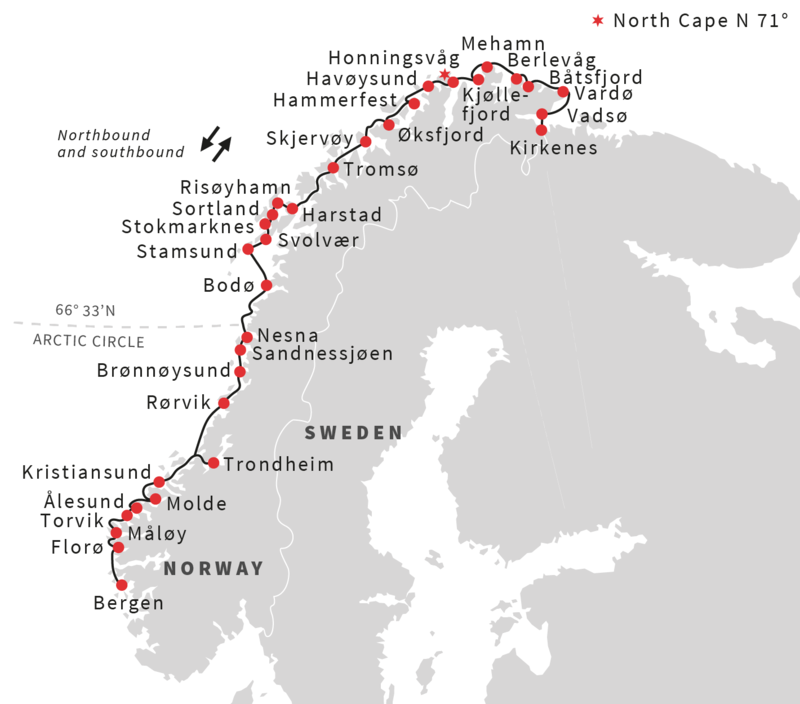 At Honningsvåg you can join a coach tour that features breakfast at the North Cape (May to October). Continue to the town of Hammerfest, founded in 1789, and Norway’s polar capital. The UNESCO-listed Meridian Column is located here, erected in 1854 to commemorate the first precise geographic measurement of the globe. We then continue south to Øksfjord then across open water to the old trading post of Skjervøy. On to Tromsø, just in time to enjoy a magical midnight concert at the Arctic Cathedral. 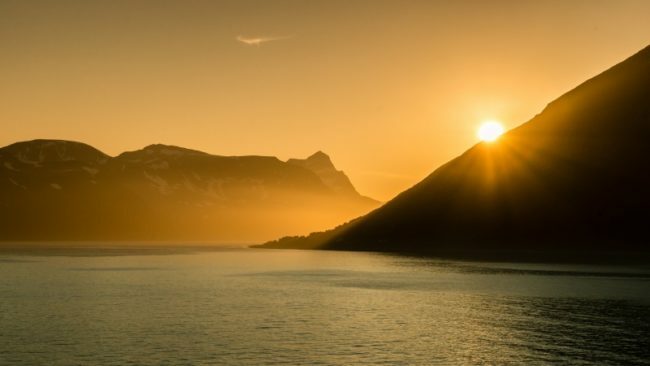 In summer, you can join a midnight excursion under the midnight sun and explore Tromsø by sea in a RIB boat. Or, a walk around the town provides you the chance to enjoy a local brew at one of the city’s many friendly pubs. This morning we arrive at Harstad, where you can go on an excursion. A Taste of Vesterålen. Experience history, beautiful scenery, and a selection of breathtaking sights, including Trondenes Church, one of Norway’s premier cultural heritage sites from the late Middle Ages. 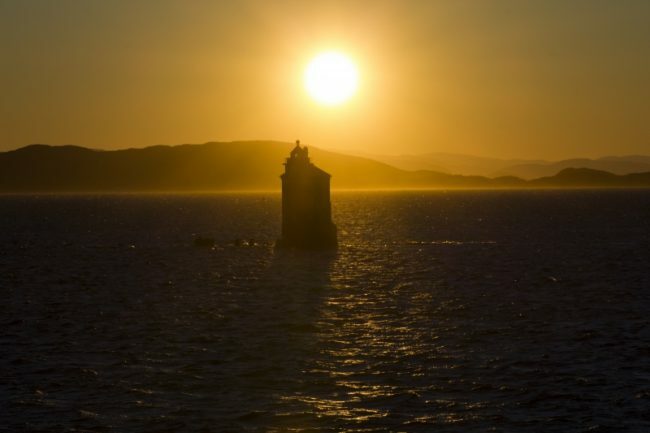 Those who choose to stay on board can admire views of this old church as we sail toward the Risøyrenna, a shallow channel made in the 1920s to provide an ‘inside route’ between Harstad and Sortland. The island groups of Lofoten and Vesterålen offer some of the most stunning scenery you will see during the entire coastal cruise. The Lofoten region is renowned for its natural beauty with steep mountains, wild nature, and small, picturesque fishing villages. The daylight sailing route through the Lofoten Islands is a highlight for everyone taking this journey. A short stop at Risøyhamn, a small village with 200 inhabitants, to deliver passengers, groceries, and mail, then we continue south via Sortland to Stokmarknes, birthplace of Hurtigruten more than 120 years ago. 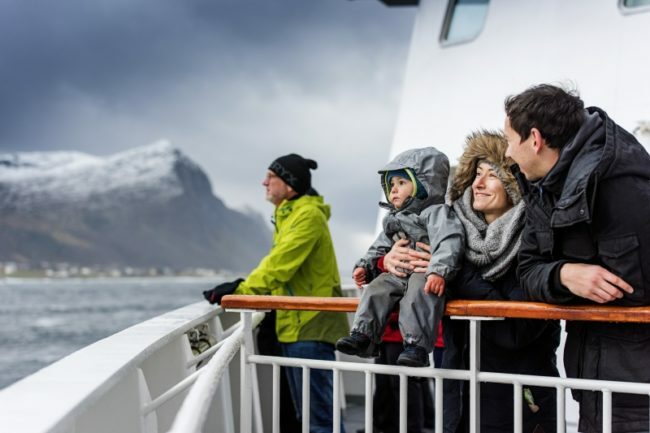 Visit the Hurtigruten museum before continuing southward. Don’t worry, it looks like you’re sailing straight into a mountain wall, but you slip through an opening leading to the narrow Raftsund. This 12-mile passage between Lofoten and Vesterålen takes you through mountains soaring 3,300 ft directly out of the sea. Then we reach the spectacular Trollfjord, only one mile long, 330 ft wide, and surrounded by majestic mountains. If weather and time permit, the captain will make a detour into the fjord. Steep cliffs hug the ship’s sides, and the dramatic landscape conjures images of an imaginary land of trolls. The Trollfjord is also the realm of the beautiful and rare birds of prey, the sea eagle. An optional sea eagle safari is available to see these magnificent birds up close. Reaching Svolvær you can join a Lofoten Islands tour to learn more about the archipelago’s fishing communities, beautiful scenery, and local art. Or go for a horseback ride and experience a sunset trot through powdery white sand on a beach along the Norwegian Sea. Want more of an adrenaline rush? Try one of our high-octane excursions by RIB boat. 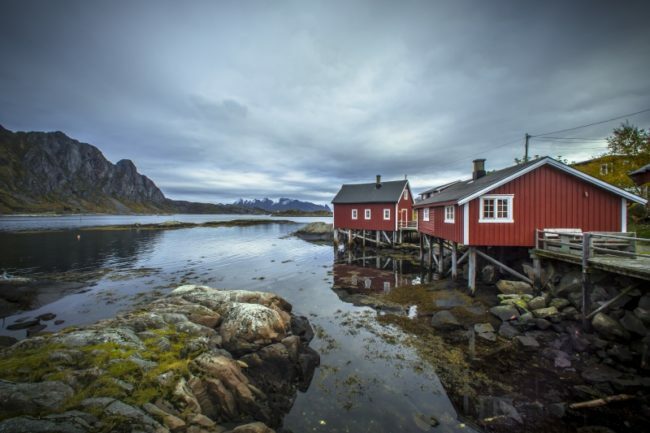 Lofoten is known for its excellent fishing and you can join a fishing trip to try your luck at catching cod (winter, spring) or enjoy a guided fishing village walking tour for insight into local history and culture. From Svolvær, we continue to Stamsund where we see the majestic peaks of the huge Lofoten Wall. We leave Lofoten during the evening and set course for the mainland. Crossing the Arctic Circle at 66°33’ N is an important rite of passage today! Sailing along the Helgeland coast, we pass hundreds of islets, fertile farmland, and steep granite walls rich in local lore. On deck you can see the strange mountain Torghatten (rising 850 ft above sea level), famous for its distinctive hole right through the middle, formed back in the Ice Age or, as legend has it, by an arrow fired by the Hestmannen troll. Another highlight is sailing past the Seven Sisters mountain range. All seven peaks are between 2,800 and 3,600 ft high, and it is easy to understand how these ‘ladies’ led to an ancient myth about seven sisters. 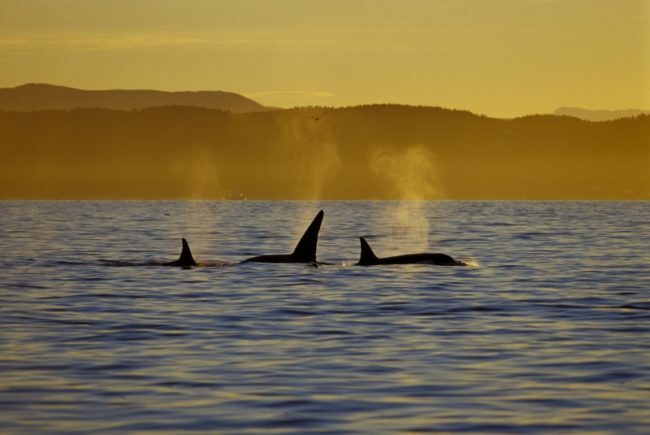 This coastline is frequently voted as one of the most beautiful places on Earth! Next we make a short stop at Nesna, an idyllic old trading post, before moving on to Sandnessjøen. The UNESCO World Heritage site of the Vega Islands is nearby and can be visited on an optional tour (summer). This unique cultural landscape consists of dozens of islands and was awarded the UNESCO designation due to the unique symbiotic interaction between the eider duck and the islands’ population. This remarkable relationship contributes to the livelihood of the community as they harvest the eiderdown and makes down-filled duvets. As we arrive in Brønnøysund, you can join an excursion to visit to the Norwegian Aquaculture Center near Brønnøysund (April to October), and enjoy an informative tour and a taste of fresh salmon. Today you’ll have the opportunity to explore the city of Trondheim, on your own or on a guided tour. 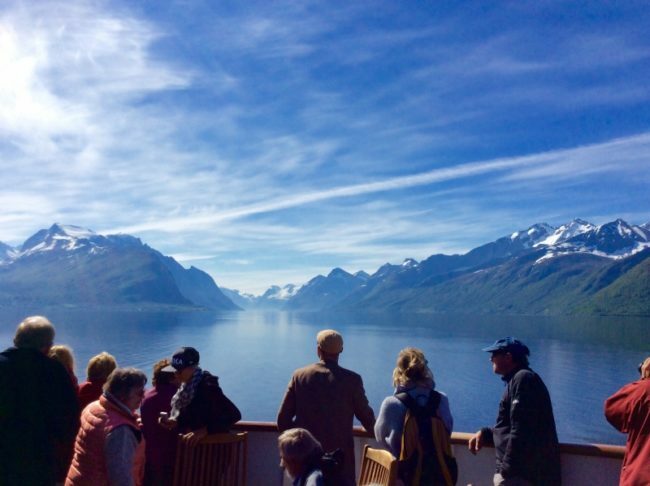 Once back on board, the ship heads out into the majestic Trondheimsfjord, which is 105 miles long and up to 16 miles wide. 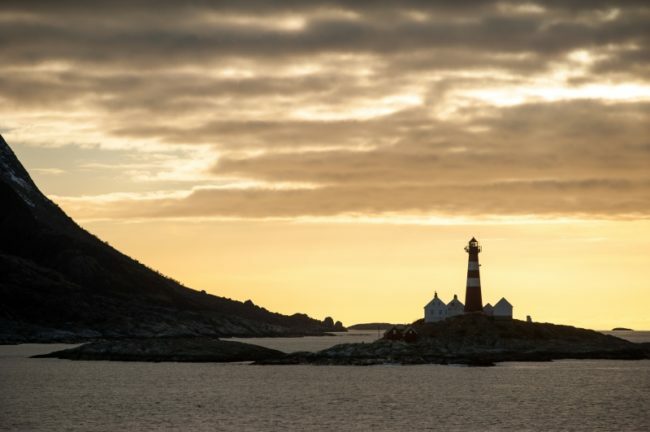 Like all other Norwegian fjords, it is deep, plunging to 1,900 ft.
As we sail along the coast, you realize the importance of fishing to Norwegian coastal communities. Kristiansund’s location has steadily provided the town with abundant opportunities in the fishing, shipbuilding, and oil industries, and is today regarded as Norway’s ‘dried cod capital’. Here you can join an excursion to the renowned Atlantic Road, five miles long with eight bridges, picturesque landscapes and open sea. Another interesting excursion is to the Bergtatt marble mine, which includes going inside a mountain, sailing across an illuminated subterranean lake, and enjoying a meal in the mine’s ‘grand hall’. 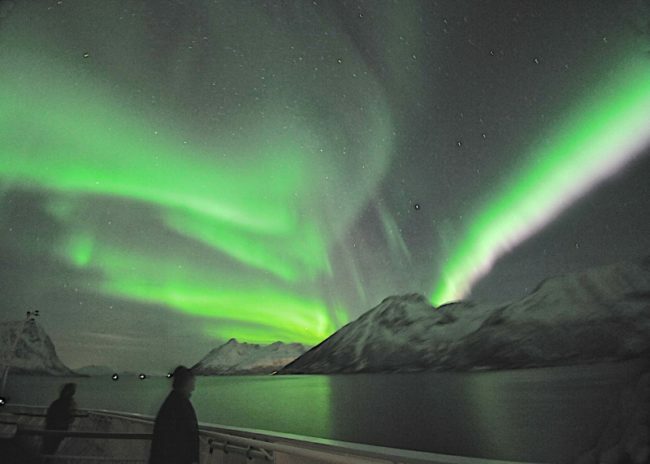 During the night, the ship will call at Ålesund, Torvik, and Måløy as the world’s most beautiful voyage draws to a close. Before we dock in Bergen, there is still lots of fascinating scenery ahead, including the picturesque Nordfjord below the enormous Jostedal Glacier. In the morning, we call at Florø, a modern coastal seaport that is also the region’s oldest town and Norway’s westernmost community. Despite constant changes, the city of Florø has maintained its special features. A few miles south of Florø, we navigate the mouth of the mighty Sognefjord and admire superb views of this magnificent. island-studded coastline. 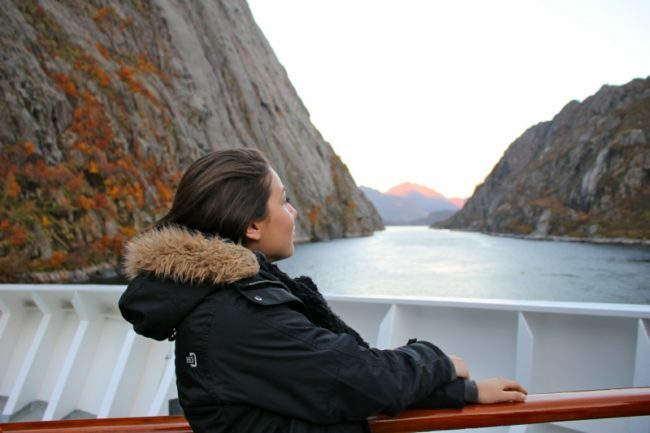 Finally, you disembark in Bergen, taking with you memories of a unique journey filled with unforgettable experiences and interactions with local people, diverse wildlife, and stunning nature. We recommend adding some time in Bergen before catching a flight out, or joining our Norway in a Nutshell program over to Oslo. Please ask us to give you the various options available, depending on your schedule. Extend your trip: Add on some time in Oslo or Kirkenes before your cruise or in Bergen or Oslo after; take a train ride through the stunning interior of Norway or do a self-drive. No matter where you go or what you do, this country is sure to delight! 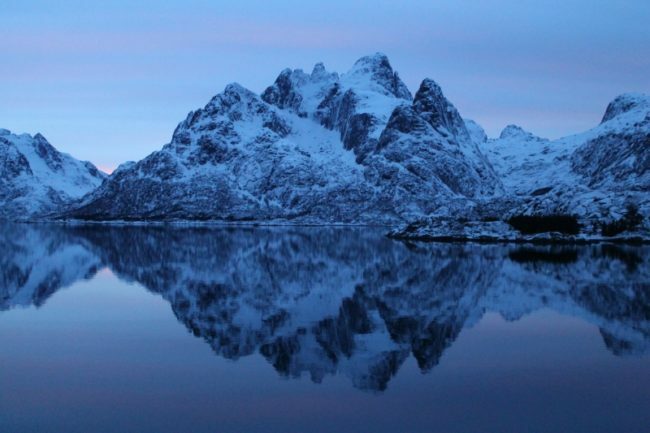 Each season highlights different aspects of Norway’s beauty.